With Mother’s day just around the corner, and I mean JUST around the corner! It is high time I put together a Mother’s day gift for my mom. Most years I default to chocolate (can’t go wrong there! ), but since this year my mom is a grandma, I wanted to do something special. Kolton and I created a cute “Grandma’s Flower Garden” to give my mom. 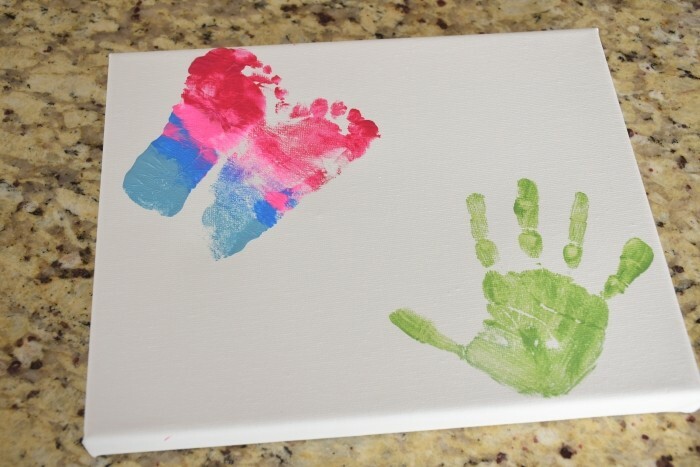 I figured the kids I nanny would also like to make this for their mom. We made a “Mommy’s Flower Garden” for her as well. Anytime you are applying paint to feet, be prepared for wiggles and squirms due to ticklishness. 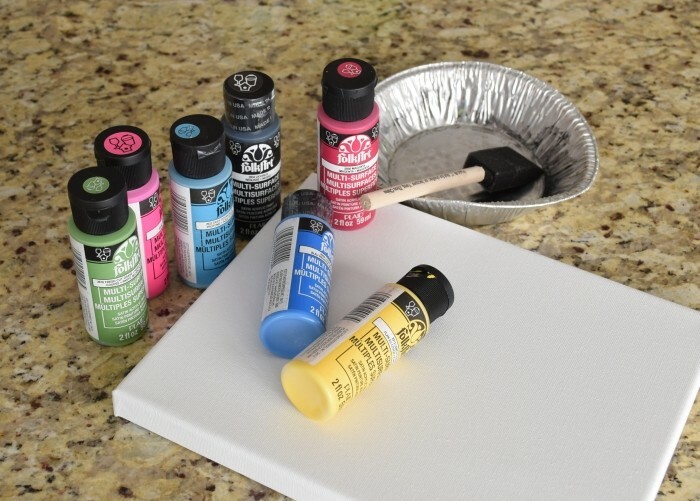 Squeeze paint directly onto the foot you plan to stamp. Use your finger to spread the paint. I had four drops of paint to spread and did so by quickly making firm passes across the foot. My paint mixed a little, but it turned out fine. 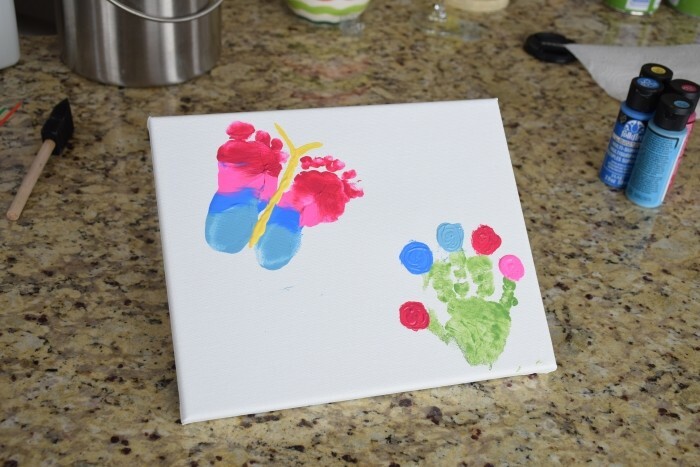 Wrap a paper towel or rag around that foot before painting the second foot. Or just wash it. The toddler had the hardest time with this. In fact, there was still enough paint on his first foot, that I pressed it against the second foot and transferred the paint that way. It didn’t turn out the greatest, but I was pretty sure he wasn’t going to let me paint his foot again. 🙂 To make the butterfly, stamp his feet with the outsides facing in. 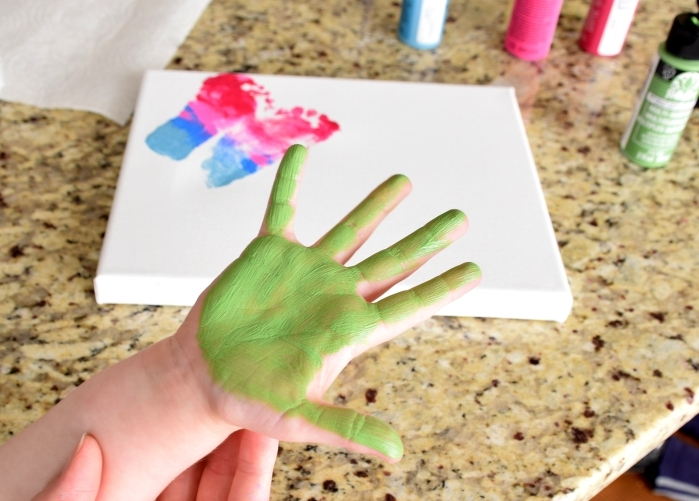 I painted the four-year old’s hand green and had her stamp it in the bottom right corner. The foam brush left lines on her hand, which looked pretty cool when stamped. 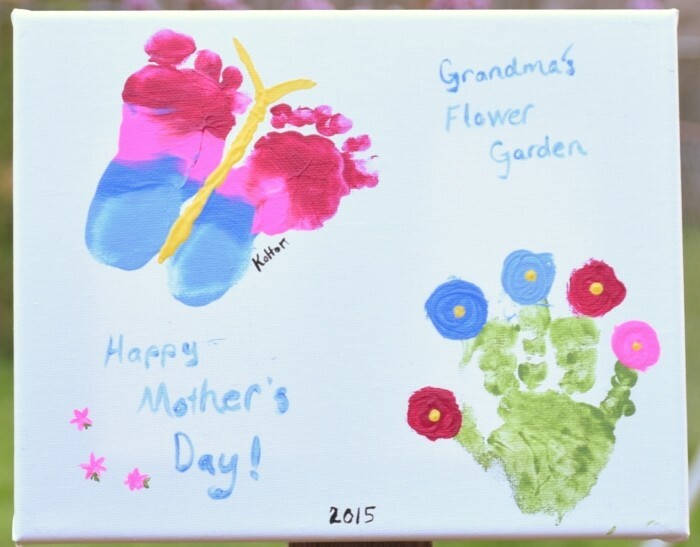 For the grandma’s flower garden that Kolton and I are giving my mom we followed the same steps. Kolton’s feet weren’t as ticklish as the toddler’s and I was able to ink both of them. However, the hand-print didn’t turn out so well. The paint on his hand was just slimy enough that his fingers slid all over as I tried to stamp them. I used a stripe of yellow paint between the footprints to make the butterfly’s body and antenna. Swirls of paint above each finger made flowers. A simple dot in the middle really made the flowers pop! Finally I painted the words on. In retrospect, maybe blue wasn’t the best color to choose for my wording, and clearly it’s time to buy another paintbrush for wording. The one I used has seen it’s better days. What do you think? Will the kid’s mom, and my mom be pleased? I think so! There’s something about those little hands and feet that really make the cutest projects. 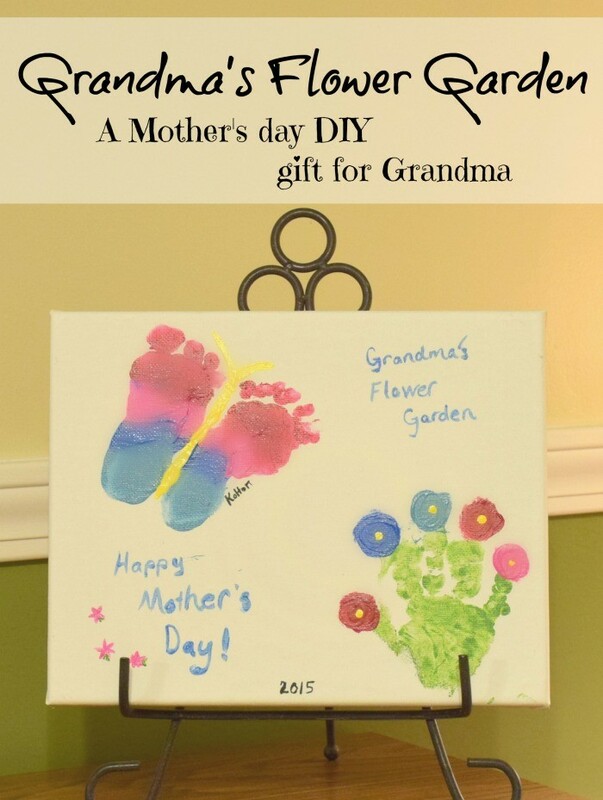 I love your homemade gift idea for Mother’s Day. 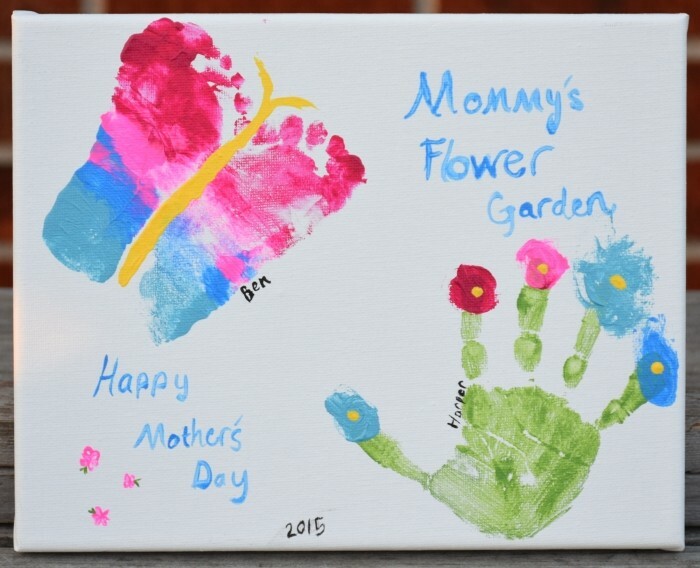 I will be featuring them in my Mother’s Day Gift Ideas at Merry Monday on Sunday at 6pm pst. Hope to see you at the party.